It was bound to happen sooner or later: when the primary facet of a character's personality is the way he handles a series of increasingly gloomy situations, eventually there's going to come a time when the storm has to break. A hero can either resign himself to his fate and curl up in the gutter or seek to reverse his fortunes with a new outlook on life – and I'll give you one guess which direction Matt Murdock has chosen. In the wake of Shadowland, where Matt truly dove off the deep end and embraced his dark side, this sudden about-face is like watching a different man beneath familiar skin. Mark Waid, no stranger to the happy-go-lucky hero, handles the change of pace more than adequately, but it's going to be difficult for long-term fans of the series to accept a shift in tone so drastic. Fortunately for the new book's sake, Waid's take is brimming with fresh ideas relating to the hero's powers and his place in the new Marvel Universe – seeing them in action for the first time is a crisp, refreshing sensation that's tough to turn away from. I'm just not sure if there's a reasonable way to explain away Matt's transition from the demon-possessed master of a murderous ninja sect to a kiss-stealing, tune-whistling, head-in-the-clouds optimist. Fortunately, Waid hasn't completely abandoned the wealth of storytelling that preceded him. 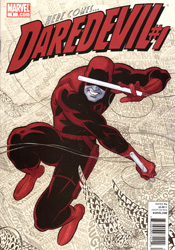 The majority of New York still believes Murdock is Daredevil, an accusation Matt jokingly deflects more than once this month, and the law practice isn't exactly running smoothly following his lengthy sabbatical. There's still plenty of thunder on the horizon, but for the time being it's grinnin' 1970s Murdock at the wheel and not the self-absorbed, violently angry newer model. Paolo Rivera's artwork serves as an appropriate compliment to the shift in tone and texture. Following a long line of gritty, darkly realistic pencil pushers, his lighter touch and bright, airy rendition of the city is a breath of fresh air. With the reality-altering villain Spot to play around with and an original perspective on Matt's oft-documented “radar vision” in his arsenal, Rivera makes his first showing a strong one. His work may not be as moody nor as flashy as his predecessors', but it's no less fitting to the style of storytelling it accompanies and on the two or three occasions his gets to stretch his legs with a splash page, it really hits the mark. Coming straight from the mouth of a longtime reader, the new Daredevil can be considered a success, but not an unbridled one. The bits of promise that Mark Waid shows in his writing are the first hints of a proposed “new direction” that really feels new, despite the similar promises made by each new writer to take the reigns since Frank Miller himself. It's an enterprising new angle that's sure to alienate some readers, but should ultimately be for the best as far as the character is concerned. Nobody should lose all the time. Not even Matt Murdock. Borrow it.